Something for Everyone everyday for Breakfast, Lunch & Dinner featuring Midwest favorites in casual surroundings. We recognize our valued guests by providing rewards when dining with us. It's Easy to Start Reaping Rewards Today! The Eatery is honored to have been awarded Restaurateur of the Year by the Nebraska Restaurant Association on April 9, 2017. 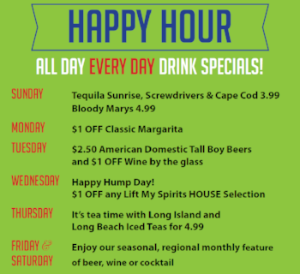 You can enjoy a refreshing adult beverage every day of the week. From Domestic, Micro and Import Beers, to Wines or Cocktails, there is always a thirst quencher on special sure to please. Click the image for selections available. There's always Something for Everyone with Breakfast served all day, Pastas, Pizzas, 1/2 Pound Burgers, assorted Sandwiches, hearty Entrees including fresh Chilean Salmon & Prime Rib on the weekends. Have an appetite for a taste of home but can’t find the time to make it yourself? 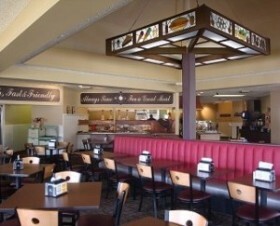 We feature something for everyone with Breakfast all day, Pizza, Burgers, Pastas, Seafood, hearty Entrees with vegetarian & gluten-free options plus a Garden Fresh 50-item Salad Bar, Junior Menu meals, fresh baked TrEATERY desserts and Beer, Wine & Cocktails for the adults. The Eatery is here to serve you as a one-of-a kind find that’s locally owned & operated right here in the heartland of Lincoln, NE. The Eatery’s offerings don’t stop there! Check out our weekend Prime Rib Dinner Special or our Lunch Combos. Besides great menu choices, The Eatery extends a Loyalty Rewards Program to our guests and a Private, Reserved Dining Room is available for professional and private gatherings to meet in the middle of Lincoln. Regardless of what you choose, all our dishes are served with generous table-side hospitality in comfortable surroundings to make your dining experience one of the best here in Lincoln. At The Eatery, you’re welcome here. Whether enjoying dinner with a friend or a large lunch meeting with your coworkers, The Eatery can accommodate in one of our open, clean & casual dining regions: our Main Dining area or Private, Reserved Dining Room.